Fr. Dimitri Sala is a Franciscan Friar-Priest involved full-time in evangelical preaching and apostolic ministry, combined with a life of prayer. Presently based in Chicago, he has conducted many retreats, days of recollection, apostolic leadership workshops, healing services, missions and revivals, and in the past has initiated a summer street ministry. With his team he has ministered to clergy, religious and laity of many ethnic groups, ages, and denominations. Fr. Dimitri has been a speaker in diocesan, regional, national, and international conferences, and has made several appearances on Christian television and radio. 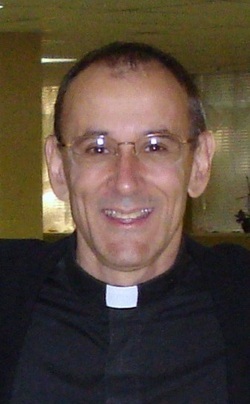 He is involved in international efforts of reconciliation between Evangelical Protestants and Catholics; as such he is part of the ecumenical ministry of Harvest Evangelism, serving there also as a faculty member for the Transform Our World Global Conferences, and is an associate to the Paradosis Center for Theology and Scripture. He has also extended his ministry through publication of a pamphlet, a book, and articles on themes of evangelism and ecumenism. The book is entitled The Stained Glass Curtain (La Cortina de Vitrales in Spanish), and is available from Creation House (or Casa Creación) Publishers. After I had my conversion, I began to fellowship with Evangelical Christians of all kinds, including Catholics. But many of my Protestant brethren challenged me about being Catholic. So I began to "do my homework," and study what the Catholic Church officially teaches. I found out that what people -- even Catholics --think we teach is often enough not what our Church officially teaches. In discovering that such widespread misinformation was part of what formed barriers between Catholics and Evangelicals, God gave me a spiritual (and often painful) burden for unity. I felt a call to bring accurate information to both groups alike in the hopes of what it can do -- dispel rumors and prejudice, and open doors to reconciliation. Eventually, I embarked on writing The Stained Glass Curtain to set the record straight by providing readers with official Catholic teachings about salvation, demonstrating that there is more of a basis for unity between Evangelicals and Catholics than we think. What would you say is the most common ground Evangelicals and Catholics stand on together though they may not know it? The most common ground is the foundation of all Christianity -- the Message of Salvation. The surprising truth is that when one examines what the Catholic Church officially teaches about salvation, the propositions of the Evangelical gospel of how one is saved are all found in these writings! What would you say is the greatest misunderstanding between the two? I believe the greatest misunderstanding between the two groups is what drove the Reformation and the Counter-reformation movements in the first place: a belief that the Catholic Church teaches we are saved by works, and the corresponding reactionary belief that Protestants think works don't matter. Like all stereotypes, these beliefs have become "set in stone" because we have not taken the time to study about and dialogue with one another. Even many Catholics who don't know what their Church teaches about salvation feed that misunderstanding. What has been your most memorable reaction to the book? There are so many things people have said, especially the endorsers, that have been unforgettable affirmations of The Stained Glass Curtain's potential for bringing about unity between Evangelicals and Catholics. Then, there was also the first report I heard back from a Catholic who read the book and accepted salvation as a result. But I must honestly say my most memorable reaction was my own: when I received the first copies, opened up the carton and saw the final product, I was stunned at what the fruit of my labor under God's grace had produced, and was filled with an awe, gratitude and humility on a level I've never experienced before. My response was to literally get on my knees and pray God to use this text as a consecrated tool for His holy purposes -- and only His purposes -- of reconciliation...His heart's desire which I have felt, carried within me, and even pained over in writing it. Describe your ministry as a whole. As a priest, I am not a local pastor. My work is basically that of preaching and of equipping people to extend the Kingdom of God; and as such, the ministry requires not only prayer, but a lifestyle that makes frequent and quality prayer possible. I accept preaching invitations which aim at direct evangelization, or themes of Christian unity. With other trained team members, I also conduct leadership workshops and sessions that equip Christians to pursue God's vision and purposes of evangelization for the Church today. The ministry has brought me to clergy and laity of many ethnic groups, ages, and denominations, as a featured speaker also in diocesan, regional, national, and international conferences, and to appearances on Christian television and radio. As of 1996, the ministry began extending itself through publication -- a pamphlet, and articles on themes of evangelization and ecumenism which have preceded this book. All this eventually led to involvement with international efforts of reconciliation between Evangelical Protestants and Catholics starting in 2006. Why do you think it is important for Christians to be united? Jesus prayed right before he died (John 17:20-23) that his followers would be so united that the world would figure out He was indeed sent by the Father as its Savior. That's profound! And it's certainly a "tall order" for us, but it makes a lot of sense. If we are saying that Jesus is indeed the way out of the messes in which humanity finds itself, how will people possibly come to that conclusion if His followers look like they can't even hang together as one unit? The visible unity of the Body of Christ demonstrates that, because of Jesus, people and groups who typically have nothing to do with each other, or who have even traditionally hated one another, can actually come together, be reconciled where necessary, and have peace. If that doesn't convince the world, nothing will. This is not to say we should pursue unity at the expense of truth -- that's why the foundation of the Message of Salvation is such a non-negotiable; but it does say that without unity we will not live the full truth...and the world will know it.